Lisans ve yüksek lisans derecelerini 1996 ve 1997 yıllarında Boğaziçi Üniversitesi Elektrik ve Elektronik Mühendisliği Bölümü’nden aldı. Doktora derecesini 2002 yılında Nebraska-Lincoln Üniversitesi Elektrik Mühendisliği Bölümü’nden aldı. Bioinformatic Core, BIDMC Genomics Center ve Dana-Farber/Harvard Cancer Center Proteomics Core kuruluşlarında yöneticilik yaptı. Nebraska-Lincoln Üniversitesi (2000-2002), Harvard Tıp Fakültesi (2002-2010), Boston Üniversitesi (2005), Northeastern Üniversitesi (2005-2006), Yeditepe Üniversitesi (2006-2007) ve Sabancı Üniversitesi (2008) gibi kurumlarda akademik çalışmalar yürüttü ve dersler verdi. Uluslararası hakemli akademik yayınlarda yayımlanmış 40’ın üzerinde makalesi bulunmaktadır. Hasan H. Otu obtained his B.S. degree in 1996 and his M.S. degree in 1997, both from Bogazici University, Department of Electrical and Electronics Engineering. In 2002, he graduated from the University of Nebraska-Lincoln with a Ph.D. in Electrical Engineering focusing on Bioinformatics. 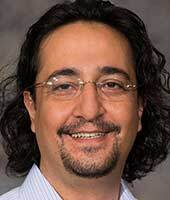 He has been a faculty member at Harvard Medical School (2003 - 2012), where he was a research fellow between 2002-2003. Dr. Otu is the founding director of Bioinformatics Core at Beth Israel Deaconess Medical Center, Harvard Medical School and Associate Director of Proteomics Core at Dana Farber Harvard Cancer Center. Between 2010-2013, Dr. Otu was the founding chair of the Department of Genetics and Bioengineering at Istanbul Bilgi University. Dr. Otu’s research interests are in the area of Bioinformatics focusing on macromolecular sequence analysis, microarrays, biomarker discovery, genetic variations and systems biology, analyzing high throughput biological data within the context of networks. Dr. Otu has published ~50 journal articles and ~30 conference proceedings, which have received over 2,500 citations. Dr. Otu has written 4 book chapters and holds 4 U.S. patents. •Otu HH*, Fortunel NO*, Ng HH*, Chen J, Mu X, Chevassut T, Li X, Joseph M, Bailey C, Hatzfeld JA, Usta F, Vega VB, Long PM, Liberman TA, Lim B. “Comment on ‘Stemness: Transcriptional Profiling of Embryonic and Adult Stem Cells’ and ‘A Stem Cell Molecular Signature’” Science 2003; 302: 393b. •Otu HH, Sayood K. “A new sequence distance measure for phylogenetic tree construction” Bioinformatics 2003; 19:2122-2130. •Kocabas AM, Crosby J, Ross PJ, Otu HH, Beyhan Z, Can H, Leong TW, Rosa GJM, Halgren RG, Lim B, Fernandez E and Cibelli JB. “The transcriptome of human oocytes” Proceedings of the National Academy of Sciences, 2006 103: 14027-14032. •Steidl U, Rosenbauer F, Verhaak RGW, Gu X, Ebralidze A., Otu HH, Klippel S, Steidl C, Bruns I, Costa DB, Wagner K, Aivado M, Kobbe G, Valk PJ, Passegué E, Libermann TA, Delwel R, Tenen DG. “Essential role of Jun family transcription factors in PU.1 knockdown-induced leukemic stem cells” Nature Genetics, 2006 38(11):1269-77. •Aivado M, Spentzos D, Germing U, Alterowitz G, Meng XY, Grall F, Giagounidis AAN, Klement G, Steidl U, Otu HH, Czibere A, Prall WC, Iking-Konert C, Shayne M, Ramoni MF, Gattermann N, Haas R, Mitsiades CS, Fung ET, Libermann TA. “Serum proteome profiling detects myelodysplastic syndromes and identifies CXC chemokine ligands 4 and 7 as markers for advanced disease” Proceedings of the National Academy of Sciences, 2007 104(4):1307-12. •Otu HH, Can H, Spentzos D, Nelson RG, Hanson RL, Looker HC, Knowler WC, Monroy M, Libermann TA, Karumanchi SA, Thadhani R. “Prediction of diabetic nephropathy using urine proteomic profiling 10 years prior to development of nephropathy” Diabetes Care, 2007 30:638-643. •Otu HH, Noxerova K, Can H, Ho K, Nesbitt N, Libermann TA, Karp SJ. “Restoration of liver mass after injury requires proliferative and not embryonic transcriptional patterns” Journal of Biological Chemistry, 2007 282(15):11197-204. •Otu HH*, Dusek JA*, Wohlhueter AL, Bhasin M, Zerbini LF, Joseph MG, Benson H, Libermann TA. “Genomic counter-stress changes induced by the relaxation response” PLoS ONE, 2008 3(7):e2576. •Al-Swailem AM , Shehata MM, Abu-Duhier FM, Al-Yamani EJ, Al-Busadah KA, Al-Arawi MS, Al-Khider AY, Al-Muhaimeed AN, Al-Qahtani FH, Al-Manee MM, Al-Shomrani BM, Al-Qhtani SM, Al-Harthi AS, Akdemir KC, Inan MS, Otu HH. “Sequencing, analysis, and annotation of expressed sequence tags for camelus dromedaries” PLoS ONE, 2010 5(5):e10720. •Kang J, Yoo J, Lee S, Tang W, Aguilar B, Swapnika R, Inho C, Otu HH, Shin JW, Dotto GP, Koh CJ, Detmar M, Hong, YK. “An exquisite cross-control mechanism among endothelial cell fate regulators directs the plasticity and heterogeneity of lymphatic endothelial cells” Blood, 2010 116(1):140-150. •Isci S, Jones J, Ozturk C, Otu HH. “Pathway analysis of high throughput biological data within a Bayesian Network framework” Bioinformatics, 2011 27(12):1667-1674. •Otu HH*, Iager AE*, Kocabas AM*, Ruppel P, Langerveld A, Schnarr P, Suarez M, Jarrett JC, Conaghan J, Rosa GJM, Fernández E, Rawlins RG, Cibelli JB, Crosby JA. “Identification of a novel gene signature in human cumulus cells predictive of an oocyte’s pregnancy potential” Fertility and Sterility, 2013 99 (3): 745-752.